A stator’s chemical formula determines how long the elastomer will last and, therefore, how much you will spend on maintenance and spare parts. This savings, or extra expense, will be a factor over the life of the pump and can significantly impact your operation and your total cost of ownership. With this in mind, CIRCOR developed the new ALLDUR® formula specifically to maximize durability and efficiency for industrial wastewater applications. by assuming their original shape and size. deformation of the stator elastomer at the sealing lines. 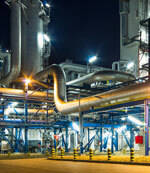 of the chrome layer, even when pumping coarse solids. Patented ALLDUR stator material has been undergoing long-term durability tests at Germany’s large Cologne-Stammheim sewage treatment plant since December 2012, where Allweiler pumps are used for thick sludge, among other uses. Two identical pumps, one with a standard stator and another with ALLDUR, were tested while pumping thick sludge from a thickening machine. Capacity was measured at regular intervals under a variety of pressures and speeds over thousands of hours for each rotor stator combination. The test results confirmed ALLDUR’s characteristics a superior stator material. With the ALLDUR® stator, capacity had dropped only marginally with a flat reduction of the capacity values. The test pumps conveyed abrasive thick sludge with approximately 6 % dry substance; capacity ranged from 5 to 10 m3/h with a discharge pressure of 8 to 12 bar. 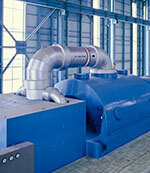 Pumps equipped with a standard stator exhibited a continual linear loss of capacity, with replacement required at the 2,746 hours maintenance interval. 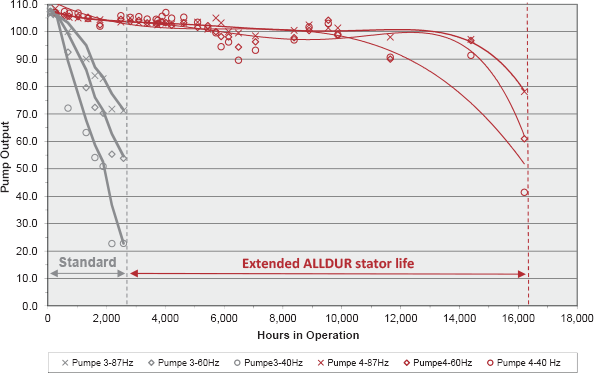 However, ALLDUR stators did not require replacement until the 16,203 hours maintenance interval—5.9 times the life of standard stators used in industrial wastewater applications. Take advantage of lower Total Cost of Ownership from ALLDUR even if your industrial pump is manufactured by a different OEM. When a stator replacement is required, use ALLDUR instead of standard stators to increase service life. Please contact us using the form on the right to discuss ALLDUR compatibility with other OEM progressing cavity pumps. Alldur Stators are extremely wear-resistant and developed for ALLWEILER progressing cavity pumps. 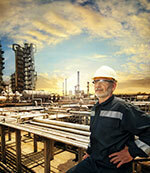 Download our brochure for product details, specs and other important information.